When I am hungry, I am not picky. I can find a lot of different options in my refrigerator or pantry that will do the trick. Give me last night’s roasted sweet potato or a couple dates stuffed with pecans and coconut or even a sprouted grain tortilla smeared with almond butter and wrapped around a banana. Instant gratification. My kids don’t yet have the ability to see the potential lurking in our kitchen that I do. That or they are incredibly lazy. While we are blessed to have an ample supply of food in our house, my children still manage to complain…”there’s never anything to eat around here!” I know. Insane. In my former life, this may have made me feel inadequate, like I’m a bad mom. I don’t want to have the house where there’s nothing good to eat! But I’m onto my kids. I can read between the lines. They’re not whining about the lack of food. They’re whining about the lack of prepared-ready-to-eat-tasty-not-leftovers-from-dinner food. And serve it on a silver platter while you’re at it! I’m sure my kids would love it if I had the pantry stocked with orange, crispy cheese-flavored curls or boxed cookies. But that’s not food and it sure won’t help them get through their homework or a 90-minute soccer practice. Unfortunately, despite what you might think, I don’t have the time to cook up homemade snacks all day, as much as I would truly enjoy that. Instead, I have taken some advice from the Chinese proverb,”Give a man a fish and he will eat for a day. Teach a man to fish and he will eat for a lifetime.” The point is that I think it’s more beneficial to my kids if they learn how to make a thing or two in kitchen especially when I’m not available to whip up something fabulous. This has been a s-l-o-o-o-w process, which I might need to speed up since Daughter #1 is supposed to be leaving for college in a year and a half (gasp.) Among other things, I have taught the girls to make one of their favorite snacks/lunches of the last 10 years. 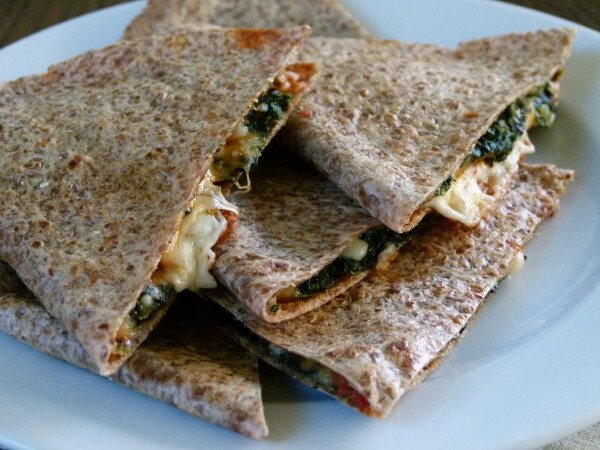 Pizza Quesadillas is a very popular and oft-requested after-school snack in our house, and not just by my girls, but their friends, as well. They take minutes to make and I usually have the simple ingredients on hand. I don’t know that they’re any better for you than a typical quesadilla, which is merely cheese (cheddar or jack) melted in a flour tortilla. 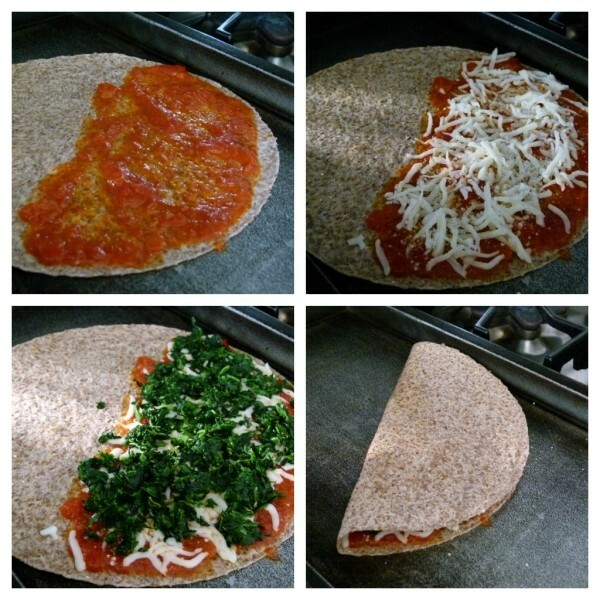 This is just a fun twist on a quesadilla and a pizza, where you use mozzarella and also a little marinara sauce. I can’t help but sneak in a few veggies, usually leftover from the night before. Anything with which you might top a pizza is fair game here. In general, I love using whole grain tortillas, either sprouted grain or whole spelt, both of which are more nutritious and more digestible than white flour tortillas. Are you gluten-free? There are fantastic brown rice tortillas by Food For Life! With all that fiber and protein, the girls fill up more quickly than if they had eaten a mess of packaged snacks and they also get the benefits of long-lasting energy until dinner time. Preheat your griddle to 350 degrees or a large, heavy skillet over medium heat. Heat the olive oil in a medium sized skillet over medium heat, add the garlic and sauté until fragrant, about 30 seconds. 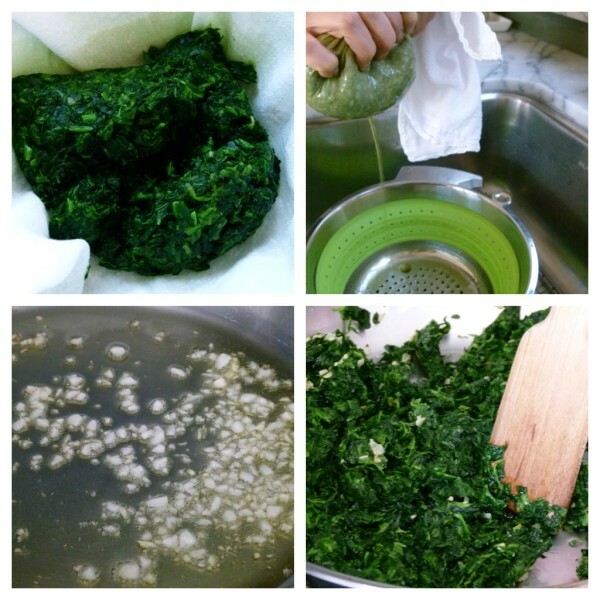 Add spinach and a pinch or two of salt and break up with wooden spoon or spatula. Sauté until heated through, about 5 minutes. If you are using a cast iron or non-stock griddle or skillet, place a tortilla on the griddle or skillet dry without any oil or butter. If using stainless steel, you may need a teaspoon of oil to prevent sticking. Spread 2 Tablespoons of marinara sauce on half of the tortilla. Follow with ¼ cup mozzarella cheese, a sprinkling of pecorino or parmesan, if desired, and ¼ cup spinach mixture on top of cheese. Fold the tortilla in half to make a quesadilla. 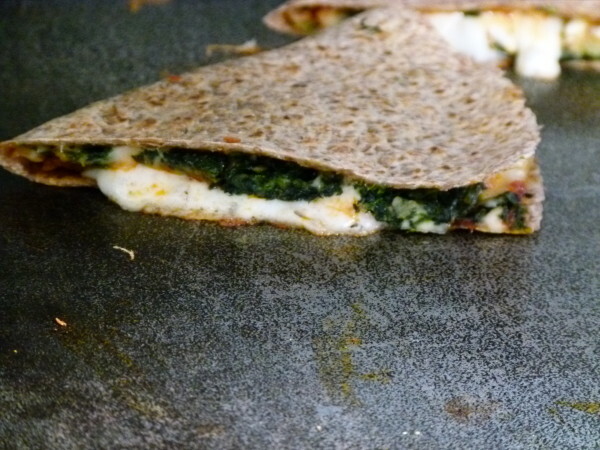 Allow quesadilla to sit on griddle until underside is lightly golden brown and flip over. Cook until cheese is melted. Slice in half or in thirds and serve. This could be made with any leftover veggies, other options include: mushrooms, peppers, broccoli, kale. It also makes a nice lunch for school if your kids don’t mind eating it at room temperature. YUMMY!!! 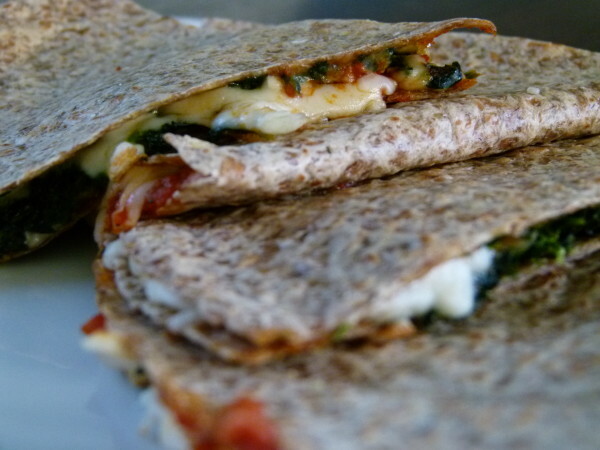 So easy and a fun twist on the quesadilla. Thanks for sharing. Well, now he’s 12 and he’s not nearly as picky as he used to be. But he still won’t eat cheese, except Parmesan. This is so easy and yummy! And baby Will devoured it! YAY! These are fantastic!! Ashley recently had a group of friends over and they loved them!! Thanks for sharing, Susan! I think these are a no-brainer with kids! We made these and they are so good. It’s my new dinner when I don’t have time to cook.